Taking a break from the questions, Chris Smith asked planetary geologist David Rothery about the exciting project he's working on that's out of this world; BepiColombo! What is this; what’s it going to do and why’s it matter. David - Well, gladly. Bepi-Columbo is a joint European Space Agency/Japanese Space Agency mission to the planet Mercury. It’s been in the planning for a couple of decades now and the launch has been delayed and delayed, but we’re finally about to go. We should be launching on the 20th October from French Guiana. The cruise to Mercury is complicated. It’ll take about seven years to finally establish orbit around the planet but when we get there we’ve got two wonderful spacecraft. There’s a British built instrument on board, one of them, which is an X-ray spectrometer which will give us the chemical composition of the surface, but will be imaging it and studying it in thermal infrared, which has never been done, and the gravity field, and the waves and particles around it. And it’s a fascinating planet because it’s the closest one to the Sun and it’s very dense so it’s a very big core and a thin rocky shell around it. And yet, despite the thinness of the rocky shell it’s rich in some volatile materials, which we haven’t probably identified. We can see places where the surface is moth eaten where it’s just dissipating away to space, it might be sublimation, it might be some other process. The most recent volcanic processes have been explosive, so we’ve got volcanic gases escaping away, violently blasting big holes in the ground and it shouldn’t be that rich in volatiles that close to the Sun. There’s a whole geological history which interests me. Other people are fascinated with magnetic field. No other rocky planet than the Earth has a magnetic field. So there’s a lot to learn. Chris - How far away is it from here to Mercury, and how’s it going to get there? David - Mercury orbits one third as far from the Sun as we do. Of course, it’s distance between the Earth varies depending whether it’s this side of the Sun or the other side of the Sun. But you can get to Mercury quite quickly if you don’t want to stop but we have a swingby the Earth and two swingbys of Venus. And then half a dozen flybys of Mercury each time passing it more slowly until, eventually, it catches up with us with such a small relative speed difference that we can get captured into orbit and start doing science from orbit. Chris - Because you’re going so fast, to try and lose that velocity, to slow down so you can approach Mercury at something other than absolutely breaknet speed, that’s the challenge isn’t it? David - You’re falling towards the Sun as you leave the Earth to get to Mercury so you’re going so fast when you get there, unless you play these clever tricks. Jess - How long will it take for information to get back from Bepi-Colombo to us? David - Well, the information will get back quickly when we transmit it. The light travel time from Mercury to Earth is anything from about 6 minutes, if it’s this side of the Sun to about 15 if it’s on the far side of the Sun, but we can’t send all the data back in real time. We have to store some of it on board and transmit it back when we’ve got a large antenna pointing at the spacecraft. Chris - When you actually get there, how long will the spacecraft survive around mercury because the conditions sound horrendous? David - The conditions are horrendous.On the day side of Mercury you’ve got the Sun with 10 times the power and a hot planet below you so it’s a difficult environment to operate a spacecraft. The design lifetime is a year; we’re hoping for a second year extended mission. NASA’s Messenger, which was there from 2011 to 2015 had a similar design lifetime and it worked for four years in the end. We’ll be very happy with two years. 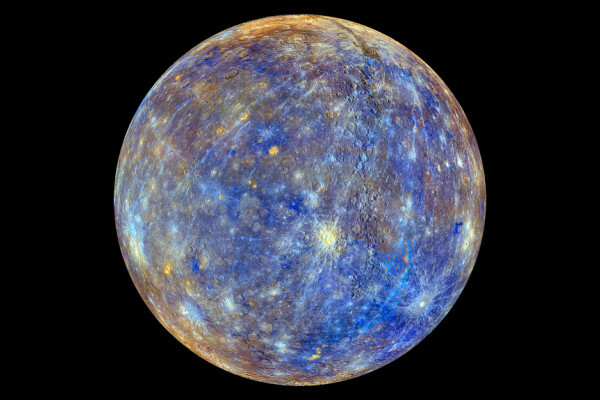 Chris - If it survives for two years, how will this change our knowledge of Mercury? What’s the number one thing we absolutely need to discover out of this mission? David - For me, as a geologist, it’s what the heck are all these volatiles doing there? We haven’t identified exactly what they are; we can tell they’re volatile substances. They shouldn’t be there if Mercury began that close to the Sun. So we’ll be finding out what’s making the interesting recently active geological processes, and where the blooming planet formed, because it may have formed further from the Sun and found it’s way inwards. Other people will tell you it’s a magnetic field and a reconnection events because with two spacecraft we can measure the magnetic field at the same time at two different places and see these sub-storms going on. There’s a whole lot to learn. It’s only the second spacecraft ever to orbit Mercury and the third one ever to visit. So there’s an awful lot to learn. Chris - And just briefly, when’s it blastoff, where from, and how can we watch if we want to find out more? David - It’s launching from French Guiana in the very small hours of the morning on Saturday 20 October. It’ll be televised - just look for ESA television on the internet, you will find it. There won’t be much to show from the mission until we get into orbit about Mercury. We’ll start doing science in 2026, which is a long time. Previous QUIZ: Elementary, my dear! Could life exist on a moon?